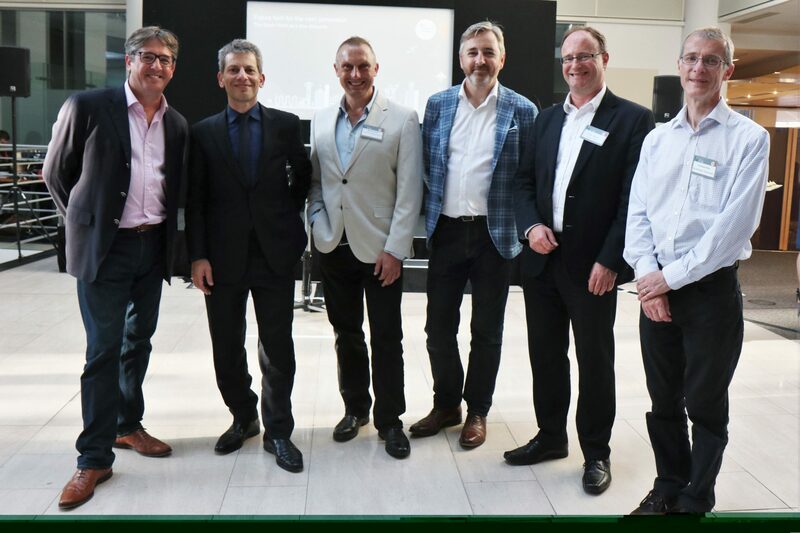 On Wednesday 6 June 2018 we hosted our smart cities event Future tech for the next generation: The South West as a true disruptor at our offices in Bristol. Our atrium showcased some of the most exciting emerging technologies from innovators based in Bristol and the South West, including Ultrahaptics, Bristol Robotics Laboratory, Virtual Viewing, Blu Wireless Technology and Dovu. Whether demonstrating the potential of next generation drones, robots that can help with assisted living or the power of new augmented reality platforms, these South West innovators demonstrated how their technologies are at the forefront of developments in connectivity, transport, robotics and prop-tech and how they may affect our lives both at work and at home. Our seminar presenters were: Irfon Watkins, CEO and Founder of Dovu, Andrew Miles, Technical Marketing Manager at Blu Wireless Technology, Steve Wright, Associate Professor at UWE’s Unmanned Flight Laboratory and Stewart Bailey, Managing Director of Virtual Viewing. “As a firm we have always worked with innovative companies. “Our clients range from traditional global technology businesses to those creating the latest breakthroughs in artificial intelligence, robotics, blockchain and 3D printing – businesses that will shape the future and how we live. “We continue to invest in training, ensuring that all Osborne Clarke people understand the commercial and legal implications of technology-driven transformation and disruption for our clients. The event closed with a memorable keynote speech by David Rowan, founding editor-in-chief of Wired UK and leading voice on next-generation technology. Speaking about the most exciting advances in the technology sector and the important questions and opportunities they raise for businesses, David took part in a far reaching and thought provoking conversation. The event comes after the release of the recent Osborne Clarke Smart Cities research report “Future Proof Real Estate – is the property sector ready for the 2020s?” which can be downloaded here, as can all of our Smart City research reports. A full report on the event has been written up in Business Insider which you can read here.